I adore this book. It's such a perfect blend of human story, science and history. You're making me want to go back and re-read it! Yes, I think Rebecca Skloot did a great job of bringing so many things together in one coherent story. I could definitely see re-reading it someday! I agree--this is one of the best nonfiction books to come out in the last few years that is both eminently readable by all audiences and having a real socio-ethical impact. That's the perfect way to put it. I don't read a lot of non-fiction, but I'm so glad I read this. I'm so glad you liked this one Lindsey :) GREAT book, great review! Thanks so much Jennifer. I'm so sad I waited this long to read this book! I loved this book. I felt like I really learned something when I read it. I have to read this book! 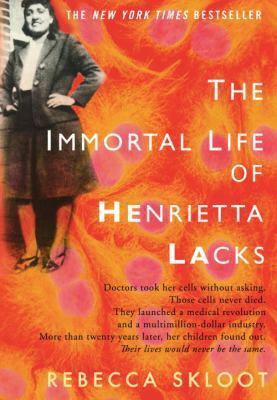 The science of it sounds interesting, but it's Henrietta and her family's story that really makes me want to check it out of the library. Thanks for another great review! I think you will really enjoy it. I felt so informed but I also felt like I had got to go along with Rebecca and the Lacks family on a crazy ride to find the truth. Yes, definitely pick this one! I tend to have a love or hate relationship with non-fiction but this book is fantastic. This book sounds so interesting! I don't read much nonfiction but the topic is fascinating and it sounds like it's really well-written. It's very well-written. I think this is Skloot's first book, but you can tell she has done a lot of writing. Sometimes a non-fiction read just hits you right in the smacker ... I need to pull this one off the pile and finally read it! Somehow it's more difficult to find a really good non-fiction read, but they tend to really stick our in your memory when you do find them!